Sally has been Operations Manager with Cushman & Wakefield | CRESCO Real Estate since 2010, bringing a diverse twenty (20) year accounting background to the firm. Sally is an effective leader with expertise in the analysis and implementation of streamlining procedures by utilizing current technological advancements. While managing the day-to-day operations, Sally has made tremendous improvements to the company’s accounting function and continues to determine long and short term improvements, enabling the company to reach a new level of service. Sally started her career as a staff accountant for a residential real estate firm and quickly advanced to a management position of a large accounting department for a mid-size company in the insurance industry. 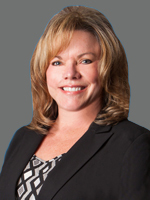 She also brings accounting experience from a Big 4 accounting firm to CRESCO.